2015 Yamaha Aerox Naked. Picture credits - Yamaha. Submit more pictures. To handle the super-responsive 2-stroke 50cc engine we�ve equipped the Aerox R Naked with a compact and rigid tubular sports frame. Running with hydraulic-telescopic front forks and sturdy rear suspension, this lightweight chassis provides the Aerox R Naked with easy handling, making it a very manoeuvrable and agile sports scooter. Ask questions Join the 15 Yamaha Aerox Naked discussion group or the general Yamaha discussion group. Bikez.com has a discussion group for every motorcycle. Here you may find answers to common questions about the model. If you do not find what you are looking for, you can ask questions. 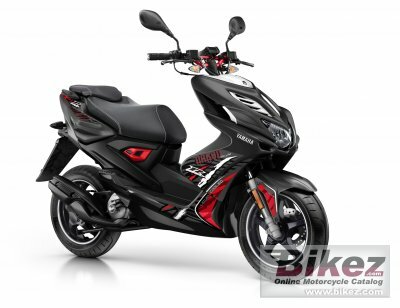 Try out the 2015 Yamaha Aerox Naked discussion forum. You can sign up for e-mail notifications when other users answer you. If you have information about any technical issue related to this motorcycle, please leave a comment for other riders.